One of the most frustrating issues podcasters have is when your podcast stops refreshing or updating on the ITunes store. Generally, Apple requires a minimum of 24 hours before your feed gets refreshed and the current episodes appear in the ITunes directory. However, to help ease your mind, this is strictly a display issue - meaning that although your most recent episode is not showing in the store, this only affects non-subscribers. Your subscribers are still getting your episode. You can verify this by simply subscribing to your own podcast and checking under "My Podcasts" for your shows. The 24 hours that Apple requires is to actually show the episode in the directory, due to the heavy processing that their servers need to refresh all the podcasts in the system. I usually see an update way before the 24 hours pass, but sometimes it will take the full amount of time. However, if after 24 hours has passed and your episode is still not showing, and you have even tried Tip #1 in my previous blog post, there is one more tip I'd like to pass on to you. Check your artwork! Seriously, if you don't know what your current artwork specs are, perhaps now is the time to check. The reason is, no matter how long you have been podcasting and your show has been in ITunes for ages, and even if you are a big celebrity like Marc Maron and have thousands of subscribers, Apple has decided to bring the hammer down on people not following their artwork specifications. If your artwork no longer meets their specs, they will simply ignore your feed and stop updating it. Period. The file size is the key issue I'd like to bring up. The size I'm referring to here is the actual file size, or the amount of space the artwork takes up on a disk drive - NOT the resolution or pixel size. This is measured in kilobytes (kb). It has been confirmed through Libsyn, that Apple's requirement on file size is set at a maximum of 500kb. So if your artwork meets all the above, except the file size is larger than 500kb, your podcast will stop updating. So how do you check your artwork's file size? The most direct and helpful tool in my media arsenal is a small, simple and free program called "MediaInfo". It can be checked out and downloaded here. Once installed (and I recommend enabling the options "Explorer Extension" and "Explorer Tooltip") you simply right-click on your artwork and read the details. Notice that on this example, the "File size" is 803 KiB (or kilobytes). So even though the resolution of 1400 is correct, the color space is correct (YUV = RGB), and it's a JPEG format, the only thing that is out of spec is the file size. It's bigger than 500kb. In order to fix this you must shrink the file size down to 500kb or smaller (499kb or less to be safe). How you go about doing this is up to you - I'd recommend using Photoshop to resize, but make sure after you do change it, that you re-check the new artwork using Mediainfo again. If after trying Tips #1 and #2 here on my blog, and your podcast still isn't refreshing properly, I would definitely contact Apple Support to see what's wrong. 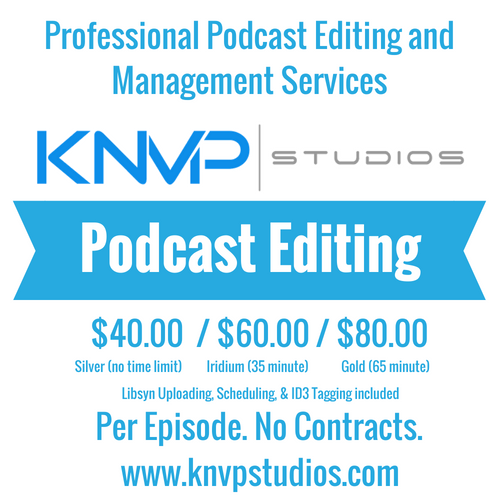 If you should need help with your podcast, including audio editing services, please contact us here at KNVP Studios and we would be happy to help. Thanks for reading, and happy podcasting! Newer PostTip #3: Podcast Not Updating in the ITunes Store? Older PostTip #1: Podcast Not Updating in the ITunes Store?